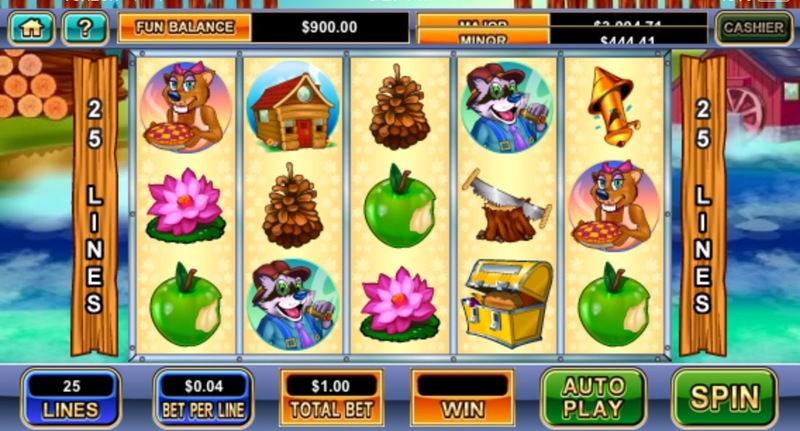 Builder Beaver is a new slots game that is featured in many of the Real Time Gaming slots libraries. This game can be found in both the mobile platform as well as the regular online casino platform. The game is colorful and vibrant and offers players fun icons of beavers and fruits! When clicking on the game, you will have a brief second of load time where all of the reels and paylines are set up for you. This game will be played with your phone in a horizontal fashion. At the top of the screen you will see your balance information as well as the minor jackpot as well as the major jackpot information. Since there are two different jackpot styles, players will have a scrolling marquee which will roll back and forth between the two jackpot numbers. To the far right, you can reload your bank with the cashier button and on the right you will have the home button and the help button for more information on the game and what each icon does. In the bottom portion of the screen, players will have the amount of lines that were selected, the bet per line amount, the spin button, auto play features and the amount you’ve won in your previous spin. Builder Beaver has a unique theme as it offers icons of beavers, houses, treasure, fruit, saws and whistles. This game doesn’t offer the same style as others in a sense that it doesn’t have the King, Queen and Jack icons that other slots games will have. This game is very simple to figure out, there are five spinning reels as well as 25 paylines to utilize. There are bonus rounds as well as free spins that are awarded during this game.